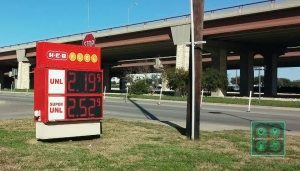 The national average price of gas barely moved during the past week, according to the latest weekly report from the U.S. Energy Information Administration. The E.I.A. report shows U.S. gas prices remained unchanged at $2.41 per gallon, but region by region, the numbers tell a different story. For instance, drivers in California are paying about 5¢ less for gas this week, but drivers in Ohio are paying 11¢ more. Midwestern gas prices are typically the most volatile and can often influence the national average, as was the case during the past week. Meanwhile, prices were mixed across the country, with prices across New England dropping by about a penny. However, prices across the Central Atlantic and Lower Atlantic states rose slightly, putting the broader East Coast prices slightly higher. For drivers in the Rocky Mountains, prices went up about three cents per gallon. Meanwhile, the price of diesel dropped in every region last week, a good sign for truckers. 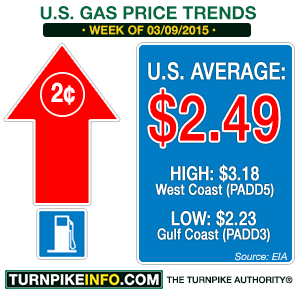 The average price for a gallon of diesel fuel dropped an even 3¢ during the past week to $2.75 per gallon. Prices were down between two and four cents per gallon in every region except the West Coast, where a one-penny per gallon increase in California prevented the regional average from moving significantly. The West Coast averages, sans the Golden State, were down two cents per gallon. Crude oil supplies in Cushing, Oklahoma are high, the result of crude production in the U.S. Photo: Ben Cochran via Wikipedia.org. Meanwhile, crude oil prices have been climbing slowly but steadily for the past month, for both domestic and overseas crude. The price of West Texas Intermediate was set to open early Tuesday at just over $52 per barrel after climbing about a half-dollar in overnight trading. Brent Crude was poised to open at just over $58 per barrel. That could signal a potential rise in fuel prices in the short term, but the longer-term forecast is that prices will continue to drop through the year. The E.I.A. reported last week the price of Brent crude is likely to fall as much as 40 percent this year, and U.S. crude oil stocks at Cushing, Oklahoma, are enough to supply the country for the next 30 days, keeping downward pressure on retail prices. The price of gas did an about-face in most regions of the country during the past week, according to the latest weekly gas price survey from the U.S. Energy Information Administration. The E.I.A. report shows the average U.S. cost for a gallon of regular unleaded fell to $3.45 per gallon. While the national average price fell 3.4¢, the declines in some regions were barely felt, while other survey districts enjoyed larger price drops. Midwestern gas prices, usually quite volatile, had among the larger price declines during the past week, with prices slipped won just over a nickel per gallon. Those price drops were outpaced only by the West Coast region, which was hit hard just two weeks ago by substantial double-digit price increases. West Coast gasoline declined nearly 7¢ per gallon last week, but the bigger declines were confined to California and its large metropolitan areas. Remove the Golden State from the averages, and West Coast gas only went down about 4¢ per gallon. Meanwhile, the drivers across the Rockies are paying much more for gas this week than last, according to the E.I.A., which reports the price of unleaded went up by about 6¢ per gallon in the Rocky Mountain survey region, the only region to experience a price increase. 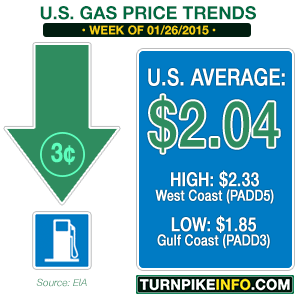 Prices across that area settled at about $2.29 per gallon, but that is well below the national average. 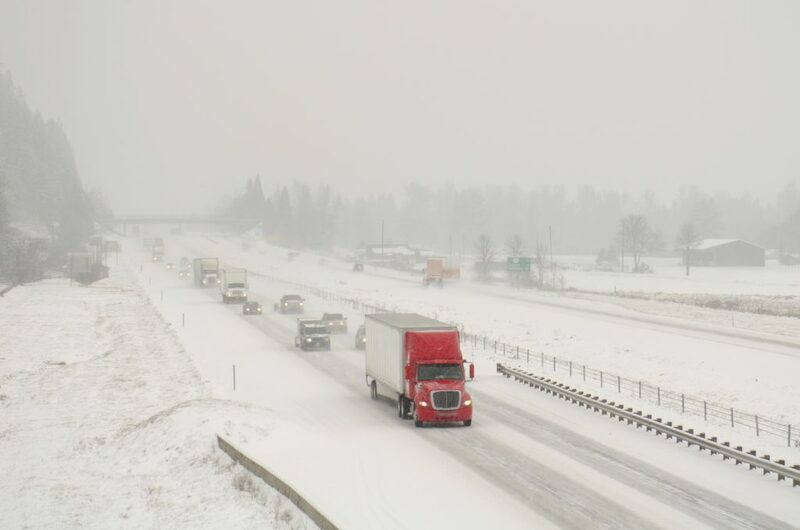 The Rocky Mountain region price increases affected truckers and haulers, too. 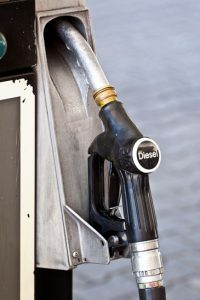 The cost of diesel increased by about a penny per gallon across the survey district last week, while the broader national average price of diesel was down nearly 3¢ last week. For truckers driving across New England, the price of diesel fell just over 6¢, giving that region the biggest price decline of the week. For those regions experiencing an actual drop in diesel prices, the Lower Atlantic states had the lowest overall price decline, at just over a penny per gallon. The about-face in gas prices came as crude oil began destabilizing once more at the end of last week. Prices had been lurking in a range from the high $40 per barrel to low $50 per barrel range for domestic crude, West Texas Intermediate. Brent crude, the overseas benchmark, had been trading in the high $50 per barrel to low $60 per barrel range. As of Tuesday morning, however, both futures indices had fallen substantially, with WTI now trading in the low $40 per barrel range and Brent in the low $50 per barrel range. The decline in prices can be traced to a pair of primary factors. 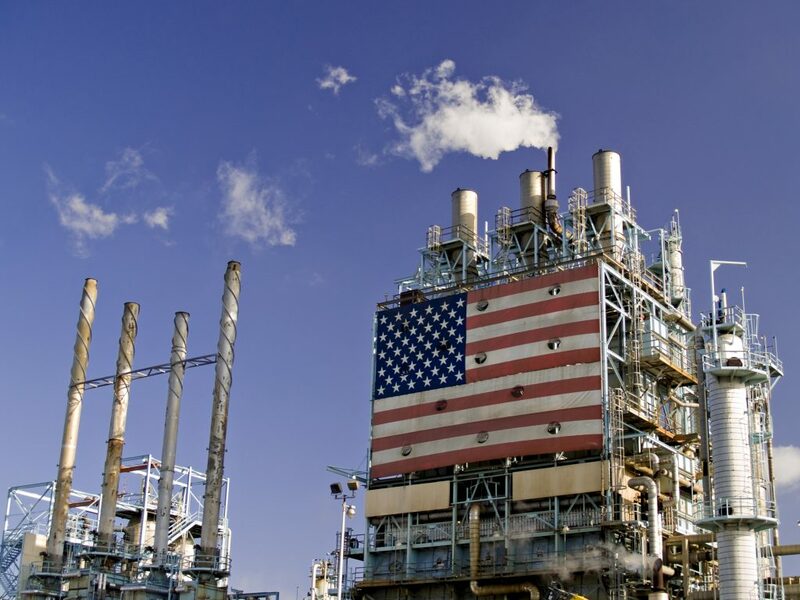 The first is the glut of domestic crude being produced by the United States, which has been a significant factor in the pricing equation for months. The other issue is the strength of the U.S. dollar, which has been gaining ground in recent weeks due to the anticipated end of bond buying by the U.S. Federal Reserve Bank. Meanwhile, the Eurozone economies are about to experience their own brand of quantitative easing, which has resulted in a weaker Euro. Combined, the actions of the Fed and the European Central Bank have many investors fleeing to U.S. dollars, which makes U.S. oil more expensive overseas. The national average price of a gallon of gas went up another two cents during the past week, as detailed in the latest pricing survey released by the U.S. Energy Information Administration. The E.I.A. 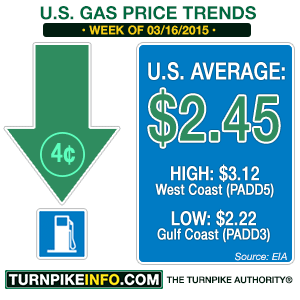 report shows the average gas price in the U.S. is now $2.49 per gallon, which is 45¢ higher than just five weeks ago. However, the price is still down well over $1.00 from this period a year ago. The price of gas surged across the West Coast last week, and while price increases were not as substantial this week, they dragged the national averages higher. The Rocky Mountain states also experienced a surge in pricing, as the region gave up its tenuous slot as the cheapest region for gas. 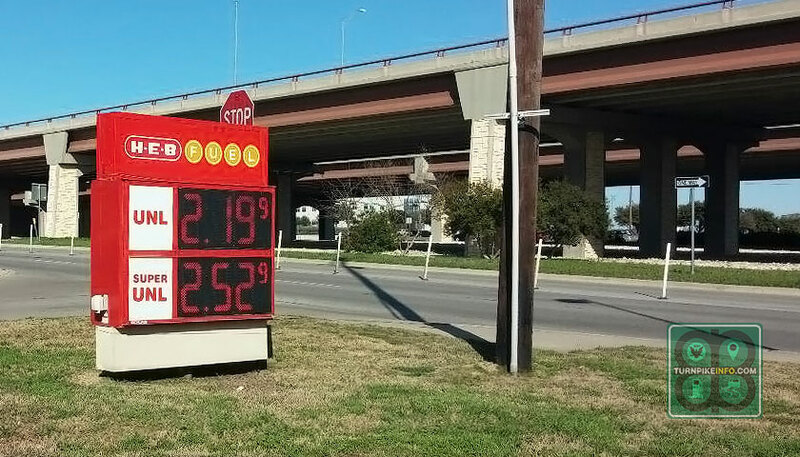 Gas prices in Round Rock, Texas, near Austin, adjacent to the TX-45 toll road. Prices there have jumped nearly 30¢ in the past month. Photo: Eric Scallion. The Gulf Coast states, typically the place to find the least-expensive gas, reclaimed their slot as the cheapest place in the nation to buy fuel. Prices across the West Coast went up 5¢ per gallon, but when California is removed from the equation, the price increases were closer to 11¢ per gallon. 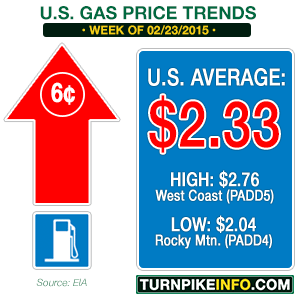 That trend also held in the Rocky Mountains, where prices jumped 11¢ week on week. In the Midwestern states, where prices are typically volatile, the price of gas actually went down, the only region to show a pricing retreat in the past week. The cost of fuel dipped by 4¢ to settle at $2.34 per gallon, which is also well below the national average. 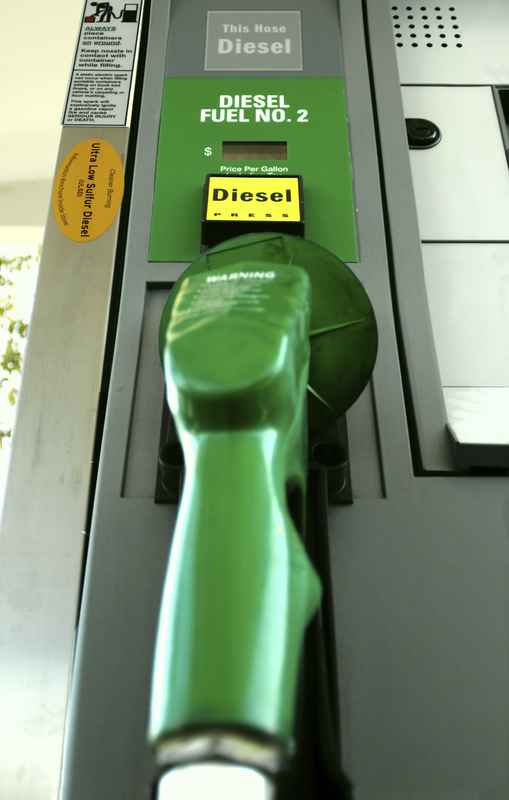 The price of diesel fuel continues to creep upward, and it is only creeping, indeed. The price of a gallon of diesel, nationwide, is now averaging about $2.94, up about one penny on the week. Diesel prices have been rising slowly, compared with their unleaded fuel counterparts, but that also follows a much slower decline in prices, too. Retail diesel costs did not decline as quickly as unleaded gasoline during the last six months of 2014. The price of crude oil continues to influence retail gas prices, but the wholesale gasoline prices are also playing a substantial role. Despite a glut of oil domestically and around the world, U.S. prices are rising, in part, because of a switch to summer fuel blends, which are more expensive to produce. Gas prices typically increase in the first few months of the year, ahead of the summer driving season. The stronger U.S. dollar is also creating problems, because it makes U.S. oil more expensive on the open markets, driving global prices higher, and that can reverberate on the U.S. retail gasoline market. The timing of that influence, however, remains to be seen. 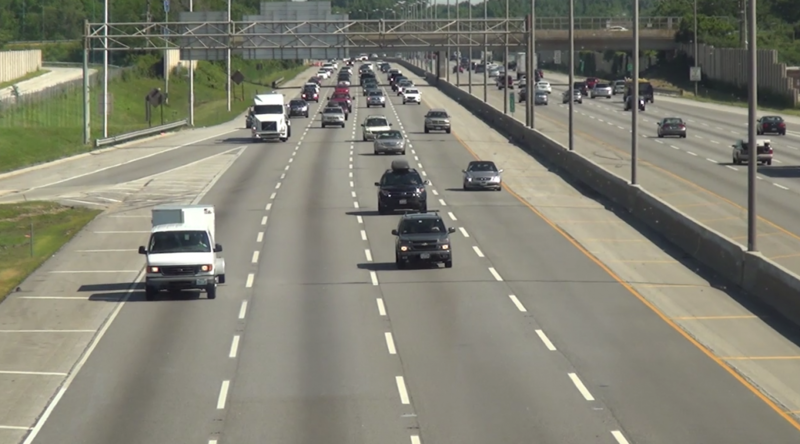 The cost of a gallon of gasoline kept declining at the rate of a penny per day, on average, during the past week, according to the latest weekly survey from the U.S. Energy Information Administration. The nation’s gas now averages just $2.07 for each gallon of regular unleaded, although prices in many areas are well below $2.00. The cheapest prices are found along the Gulf Coast, where the average cost of gas is only $1.84, followed fairly closely by the Rocky Mountain survey region, where prices are $1.91 per gallon. The Midwest is averaging $1.92 per gallon. While the remainder of the survey regions have prices above the $2.00 threshold, even the most costly gas, found on the West Coast, is now only $2.38 per gallon. 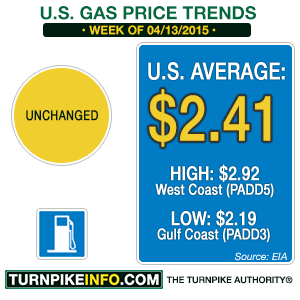 Gas prices have continued to decline even as crude oil prices have finally leveled off, somewhat. The retail cost of fuels had been following the precipitous decline of crude since the middle of summer, when gas prices were in the high $3.00 ranges, and well over $4.00 in some parts of the country. Such prices seem almost nightmarish in the wake of the today’s cheap prices. Meanwhile, the price of diesel has slipped under $3.00. The national average for diesel is now just $2.93 per gallon, with some survey regions enjoying prices as low as $2.83, as in some parts of the West Coast, though not in California. The Gulf Coast region has the lowest overall price for diesel, where the prices are averaging about $2.84 per gallon. Overall, the year-on-year price changes are substantial. 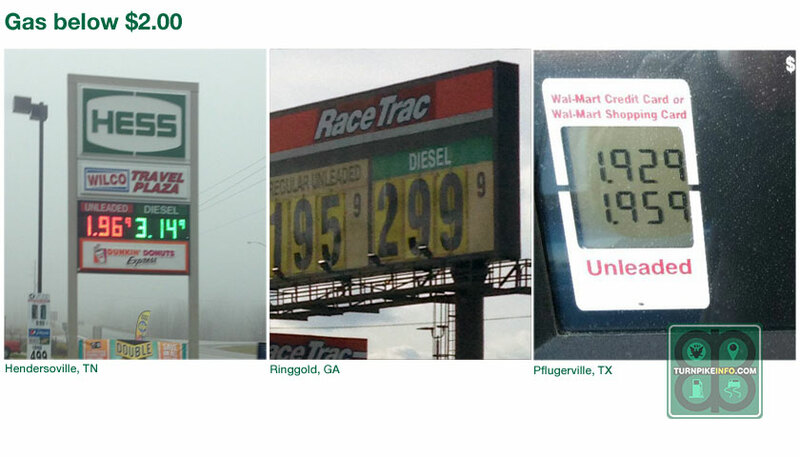 For truckers, the cost of a gallon of diesel is about 94¢ less than this time last year. 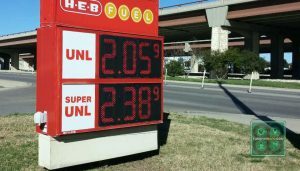 For commuters, the cost of a gallon of regular gas is now $1.23 less than at the start of 2014; however, the price decline since the middle of the summer is even greater. During the past year, the nation’s average gas price, according to the E.I.A., topped off at $3.71, at the end of April, 2014, and again at $3.70, at the end of June. Those levels are $1.64 and $1.63 higher than the current price average of $2.07. Whether prices will continue falling, however, remains to be seen. The reason is that crude oil prices appear to have halted what had been a calamitous fall since the middle of summer. West Texas Intermediate, the domestic crude benchmark, has been hovering between $46 and $50 per barrel since about January 6; Brent, the overseas index, has also been more stable since the 6th of January, trading in a range between $48 and $52 per barrel. However, both indices are still trending slightly lower, albeit at a much slower pace than the latter half of 2014. The likelihood of crude oil rebounding enough to halt the gas price decline remains uncertain, but at least one OPEC minister told an economic summit meeting in Davos, Switzerland he expected prices to normalize soon. Without providing a timeline, OPEC’s secretary-general, Abdullah al-Badri, said he believed crude prices would begin rising as investment firms scaled back their exposure in future production.